Ready to start our 2010 model train auction. 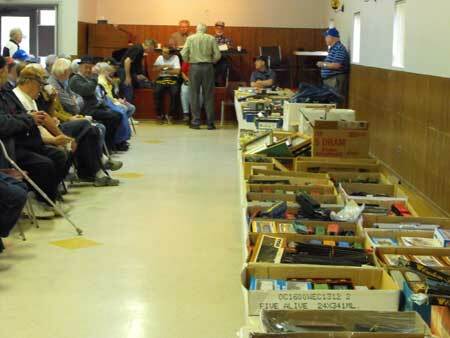 Our model railroad club has been holding a model train auction on the first Saturday in May for almost two decades. It's our way or raising money to support the activities of our Nottawasaga Model Railway club. 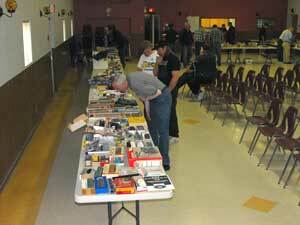 The better known model train auction in Ontario, Canada is held in the Fall in Harriston, however, we've developed a loyal following over the years. We never know what's going to turn up. We've had some great deals including estate sales. Usually there's more HO scale equipment for sale, but other scales are often represented. On this occasion we did have some N and HON3 but no tinplate or O-27 Lionel. We allow reserve bids on locomotives if you can prove it runs. We have a test track for that purpose. Otherwise you take your chances. There's normally quite a few scenery items from buildings and trees to people, pigs and cows! to decide what you want to bid on. We start receiving lots for sale around 8 am, allow pre-inspection by attendees until 10:45 am and start the auction at 11 am. We normally run until 3 or 4 pm depending on the number of lots. We auction individual items or groups of items. There's no charge to bring items for sale. We take a 10% commission on each sale. Everyone pays a small entrance fee. So far we've been able to keep it to $4 to cover the cost of renting the hall. We also have a kitchen where we sell sandwiches, cookies, soda pop, coffee, etc. Club members donate the food and our wives run the kitchen. get the model train auction rolling. 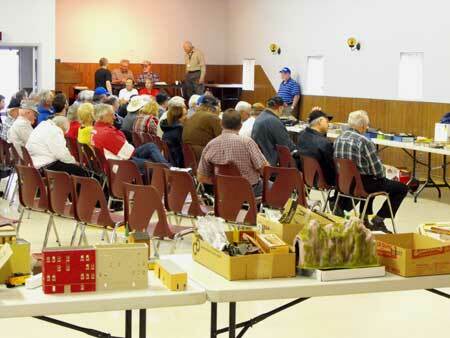 Our model train auction is an informal event and a great way to pass a few hours and pick up some good deals. Our location is the United Church hall in Stayner, Ontario. Look for the posted Train Auction signs in Stayner on Airport Road and Highway 26. 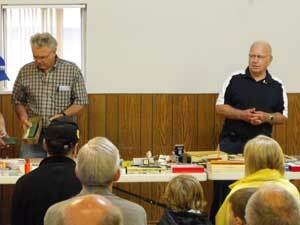 Our model train auction is always on the first Saturday in May, rain or shine. Return from "model-train-auction" to the NMRC club overview. Return from "model-train-auction" to my Home Page.